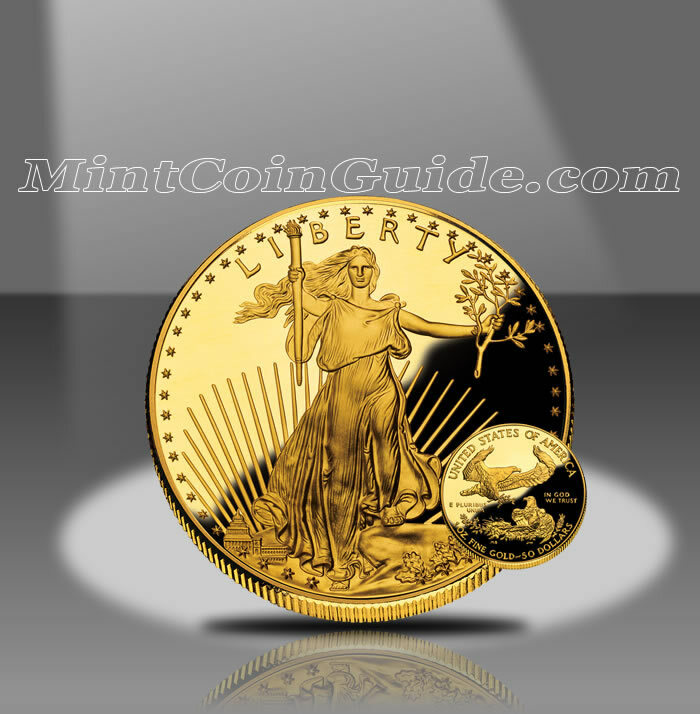 The 1991 American Gold Eagle Coins continued a mintage decline across both the bullion and proof varieties of the strike. After experiencing intense demand in their inaugural year of 1986, Gold Eagle’s saw declining interest in each successive year up to and including 1991. That trend would be somewhat reversed the next year, especially in the bullion Eagle mintage. No doubt influencing the lackluster sales of the Eagles, the price of gold continued to also show declines. For the year, it came in at an average of $362.11 an ounce, down $21.40 from the 1990 average of $383.51. Bullion Gold Eagle mintage continued a slide that really started after the inaugural year for the strikes of 1986. There was a slight reprieve from the decline in 1989 owing to increased demand for the smaller 1/4 ounce and 1/10 ounce Eagles, but that was short-lived and the 1991 mintage would mark the lowest number of Bullion Eagles produced up to that point. Proof Eagle mintage also declined significantly for the year, however the 1/2 Ounce Proof Eagles did mark a slight up-tick in the total number sold. That increase, however, was easily off-set by the lower number of One Ounce, 1/4 Ounce and 1/10 Ounce Eagles. The 1991 Gold Eagles would be the last year in which the Mint used Roman numerals for the date. Proceeding with the 1992 strikes, the Mint would use the more commonly accepted Arabic numerals. Gold Bullion Eagles were available for most of the year from the US Mint. Proof Gold Eagles were sold directly by the US Mint for $570 for the One Ounce Gold Eagle, $285 for the 1/2 Ounce Gold Eagle, $150 for the 1/4 Ounce Gold Eagle and $70 for the 1/10 Ounce Gold Eagle – the same price it had in place the previous year. Bullion Eagles were sold by the Mint’s network of authorized purchasers for a small premium above the spot price of the gold contained within them. Fractional Proof Eagles were struck at the US Mint’s facility in Philadelphia and indicate that with a ‘P’ mintmark. The One Ounce Gold Proof Eagle was struck at West Point and shows a ‘W’ mintmark. Bullion Eagle striking responsibility was said to be shared between the two facilities as well, but no mintmark is present on those coins. Augustus Saint-Gaudens’ designed the Lady Liberty which is found on the obverse (heads side) of the coin. It was was first featured on the Double Eagle coin from 1907-1933. Miley Busiek designed the reverse (tails side) to show a family of eagles and their nest.